Next month my wife and I will celebrate two years of marriage. It’s pretty crazy to see how fast the time has flown by. We’ve learned a whole lot about each other during the past two years, including a ton about how we manage money together. It hasn’t been an easy road. Marriage is super tough and not for the faint of heart. But it’s been really really great and I wouldn’t trade it for the world. Money is one of the most difficult things to deal with and especially when someone else is involved. In fact, it’s one of the leading factors in divorce. And it’s no wonder. Money is extremely personal, emotional, and complex. Throw that in with a couple of newly-weds who are still trying to figure out how to live with someone else and you’ve got a recipe for disaster. Like I said, we’ve learned a lot these past two years and today I want to take time and share some of the money lessons we’ve learned. Whether you’re single and think you’ll get married one day, getting married soon, newly married, or even married for awhile, dig into these tips and take them to heart. So get out your stone and chisel and get ready to dive in. So here’s the deal, you didn’t get married to act like you’re single. You might be thinking “duh”, but seriously, really think about it. You got married because you want to do life with someone else. That means being a team. Plenty of couples will try to manage money totally separately. They have separate accounts, separate bills, separate spending, separate everything. And that’s fine to a certain extent and I’m not going to tell you that it’s wrong to do that. But marriage is a team sport. You’ve got to work together on both of your dreams. And in order to be an effective team, you’re going to need to work together when it comes to money. If you both aren’t on the same page, you need to get there quickly. The fastest way to mess up a marriage is to be on two totally different game plans for how the money should get spent. Figure out where you want to go in life and plan together to make it happen. It’s important to remember as you go through this that both people’s views and opinions are equally valuable regardless of income. Unless you are both working the exact same job for the exact same company, one person will make more than the other. And that’s okay! You should be happy for your spouse if they make more than you because you’re a team, remember? It’s “our” money now, not “his” and “hers”. Just make sure that when it comes to how the money gets managed and where it goes, both people get to have an equal weight in the discussion. That’s the only way it’s going to work well long term. Always remember what you vowed: Till Death Do You Part – That means you’re going to be together for a long time, so why not start acting like it? Sit down early on in your marriage and discuss broad topics like what your big dreams are, your long term plans, what you want to do in life, and what’s important to you. Don’t get too bogged down in all the details here for now. These things will likely change over time as your interests change. But you need to get a good baseline of the things that are important to both of you and a good plan for what you want to do as a married team. So sit down together and figure out your plan. Money is super emotional. Sure, money is all numbers so there’s some math involved. But it’s actually more of an emotional topic rather than a rational one. People have their own feelings when it comes to spending, saving, managing money, dealing with debt, and investing. To be an effective couple you’re going to need to be open and honest about how you feel. If you have a hard time spending and tend to be frugal, that’s okay, speak up and voice that. If you’re a natural spender and have a hard time saving, voice that. If you get anxiety when you start thinking about managing money and dealing with debt, voice that. It’s never good to keep your emotions bottled up inside your marriage. The other person loves you and is there for you, so open up and talk about the way you perceive and deal with money. Which leads right into the next point. Look, I personally (totally my fault) have ruined a lot of fun evenings with my wife by doing this. I’m naturally a frugal person when it comes to spending money on myself. I enjoy giving and spending for others, but I don’t enjoy spending money on me. Early in our marriage, whenever we planned to go do something together on a date, I could enjoy it. But if something unexpected came up, an extra cost that I didn’t foresee, I would become frustrated and upset. It would make me bitter and I started to hold that frustration in. But obviously, people can’t hide emotion nearly as well as they think, and I’m no exception. Hanna would notice and then ask me what was wrong. This, in turn, would make me more frustrated and I would get in a bad mood and become a complete jerk. (Yes I know, I’m a 2-yr old). Long story short, we’ve had too many could’ve been great evenings, ruined by my frustration and stubbornness. I’m telling you this because I want you to know that it’s just not worth it. It’s no fun for anyone and totally ruins everything. Nowadays whenever I feel myself starting to get frustrated with money I just tell her. I catch it early before it ever escalates to deep frustration or even anger. I voice my concern early and we talk about it. She’s always very understanding and most of the time just talking about it helps me get past it. So when you start to get frustrated about money whether it’s spending too much, not spending enough, or something the other person has done, don’t hold it in. It’s going to come out eventually anyways and when it does, it’s only going to make matters worse. Get it out there and talk about it. So you just learned a major natural tendency for me. I’m a consummate planner. And if an unexpected expense comes up, it’s likely to stress me out and get me frustrated and worried. I know this about myself and Hanna knows it too. That’s really important because it helps us deal with money together as a team while keeping that in mind. One of the ways we deal with that specific tendency is by having a large unexpected expenses budget item each month. We generally plan for $200 – $250 in unexpected expenses every single month. This helps keep my stress level low because even though I don’t know the specific expense, we’ve already planned on it so it doesn’t stress me out. In order to do this, you first need to be self-aware enough to know your own tendencies. As you go, you’ll naturally learn more about each other, but it’s good to start off trying to explain to the other one what you already know about yourself. Knowing this stuff has really helped us be able to relate more to the other one. 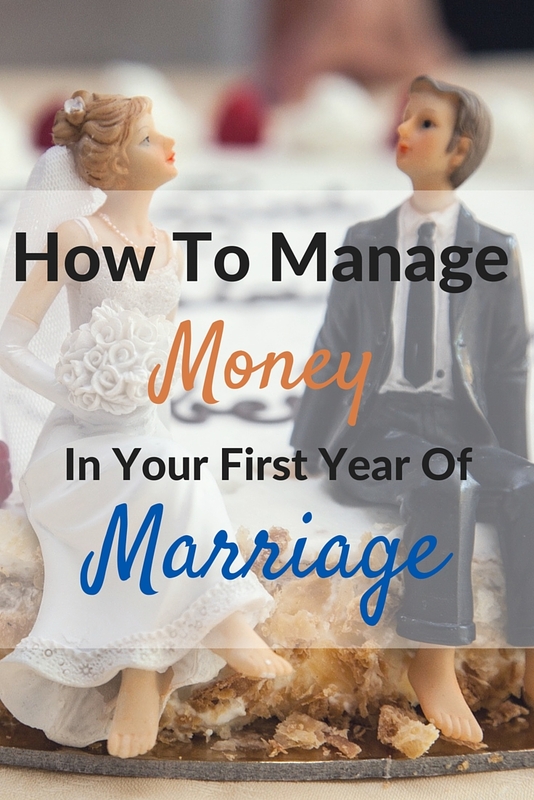 It’s helped us understand where the other person is coming from when we talk about our money and has been one the best things we’ve done for our marriage. After you start to get a good feel for what’s important to your spouse, it’s extremely important to start putting their needs first. This should be the case in every aspect of marriage, not just money. But it definitely needs to be something you do with your finances. Hanna and I both make lots of sacrifices so that the other one can get something or do something they want to do. There have been multiple instances where each of us has put something on hold so that the other could get something important to them. This is so key to having a healthy marriage. Since both of us are naturally looking out for the others needs and desires, we both get served and grow even closer together. If we were constantly looking out for ourselves first, we’d be on a quick road to disaster and the entire concept of the team would fly right out the window. Constantly look out for other person and try to help them achieve their goals whether it’s a getting a certain item, saving for something, or a career advancement/change. Although you are a team and need to work together on where the money goes, you’re still an individual person and need to have a certain amount of autonomy. Otherwise, it’s going to literally drive you crazy. Set an amount of spending money each month that both of you get. This should be the exact same amount for each. This is your spending money to use on whatever you want, no questions asked, no need to worry about what the other thinks – every single month. You’ll have to figure out what number works for you and what fits into your budget. At the time of writing this, our spending money is $45 each per month. Yours could be lower or higher depending on your overall budget goals. We’ve found that having at least some amount of money that we can do whatever we want with has been super refreshing, even if it’s only a few dollars a week. Not having to worry what the other person might think when we bought something has been such a relief. We didn’t do this at all for the first year of our marriage and it was really tough. We constantly felt like we had no money, even though we did because if it didn’t fit exactly into the budget, we couldn’t buy it. Or if we could buy it, but we felt really bad about it. And that’s not the point of money at all. By implementing this spending money we’ve gained freedom to buy things when we want and also stay on track with the rest of our budget. You could totally go old school and use cash, some paper envelopes, and your notepad. But come on, we’re living in the 21st century. Get something that you can put on your phones so you both know where you’re at. Get a personal finance/budgeting software that you can sync on both of your phones. There are lots of great free options like Mint, YNAB, and Personal capital. There is also paid software like Quicken and iMoney. For pretty much everyone, the free online software will be perfectly fine. The important thing here is just to get a piece of software that you can both have access to. This helps you both stay up to date on your spending on budgeting without having to rely on the other person to tell you about it. Odds are one person will naturally be more willing and ready to handle the financial maintenance. That’s great, that person can be responsible for tracking the spending, paying the bills, and managing the money if that’s the way you want to do it. That’s the way we do it, and that doesn’t mean you’re less of a team. Hanna is perfectly capable and willing, but since I naturally enjoy… like literally get thrill out of it… I manage the money and make sure things are taken care of. But we still talk about money and where we’re at multiple times per week. For us it’s natural and comes up in conversation over dinner, on the couch, or while doing chores. You both need to be aware of where you’re at in your marriage and money goals. If you’ve got big goals like traveling, getting a house, buying an RV, getting a dog, or saving for kids, how will you both know if something changes or things need updating if you’re not talking about it? So many couples go on just spending money on their own without ever talking. That’s not wrong per se, but good grief, that’s a horribly inefficient way to reach your goals as a couple. You need to be talking about it and constantly re-assessing how your goals are coming along. For some couples it will be like Hanna and I. It will become a natural part of the conversation that comes up regularly. For others, you’re going to need to work a little harder at this. Or maybe you both just spend 15 minutes every Sunday night to look at the budget and discuss your goals for the week. Just figure out what can work for you whether it’s formal or informal and stick with it. Once you start doing this, it will become more natural over time and keep you on track to actually reaching your goals. Things will come up and you’re going to have new expenses that you never had when you were single. If you’re a guy, get used to adding new items to the grocery list that you don’t even know what they’re used for. There’s literally so many kitchen utensils we have now that I still don’t know how they’re used. If you’re a girl, get used to a much higher food budget. These guys can eat, and it’s going to be a lot more than you ever thought. Not only that, but you’ve now got a whole new extended family with nephews and nieces that want birthday and Christmas presents. Go ahead and double the amount of Mother’s day and Father’s day gifts while you’re at it. Oh and don’t forget all of the weddings your spouse is going to be in next year for those old college buddies. That’s a few hundred dollars a pop. And pets! Don’t forget pets. Vet bills, food, play toys and accessories. All kinds of brand new expenses. As you can imagine, life gets a whole lot more expensive after you get married. And that’s okay, it’s part of the gig. You’ve got two people now instead of one. Go back to putting their needs first, remember? You’re going to need to learn to be flexible and roll with the punches. You might not hit the exact budget goals every single month, and that’s okay. Just make sure your overall trend is going up, not down. Things are going to change, your goals are going to change, your interests are going to change. And that’s all great, it’s a natural part of life, just be ready to change with it. Always remember, you got married because you love each other and want to do life together. Don’t let money come between you. Money is one of the largest reasons for divorce in this country and understandably so. It’s very difficult to deal with money in a marriage. But try your best to remember why you have money in the first place. It’s a tool to help you live a better life and live closer to the ones you love. It doesn’t bring happiness and it doesn’t solve your problems. But when you use it together it can be a tool to actually strengthen your marriage and bring you closer. So as you go about managing your money, try to remember why you married your spouse. And keep that in mind as you move forward. It will be so much easier if you do.